Laziness is the bane of all mankind, especially for someone like me. But since you can't avoid it (I have tried!) I come up with ways to work around it. Since repetition is not the forte of my kind, it's always one shot at glory. Right, enough of the prose. In the real world what this translates into, for example, is always filling fuel nothing less than up to the brim. But people like me are a minority (Thankfully Ed.) So at a petrol pump you find the majority of the two wheeler population filling fuel worth a 100 rupee note and then scurrying about in their daily existence. The Dream Yuga is Honda throwing down the gauntlet at Hero MotoCorp's Splendor. Honda hopes the Yuga will catch the attention of the 'busy people' and thus eat into the numbers of one of the world's largest selling motorcycles. So we decided to pit the two in a non-lethargic fuel efficiency test. But the catch was this. We wouldn't do the full-on accurate speed-matched, tankful to tankful test but the real one. 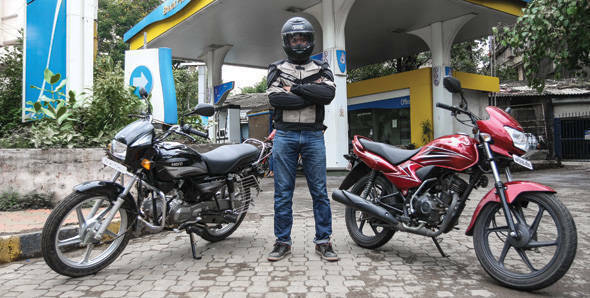 Two bikes, Rs 100 of fuel each, ridden on the same route in Mumbai traffic at speeds that felt right. The winner would travel further on the fuel. Simple. So we filled both bikes with 1.36 litres of petrol and set off. We started with the Splendor. It was my first ever motorcycle and so the familiarity was instant. Kick-start the bike, use the heel to shift down (When in Rome...) and off we go. The Splendor isn't a quick or hurried motorcycle and it has a clear sense of what speed is best for economy. Ride in the green zone marked on the speedo in top gear and it's quiet, refined and yes, fuel efficient. Ride harder and it will do your bidding but not without protest. But this was an average commuter's run in traffic so I kept the needle in the green and whirred along lazily. At these speeds motorcycles don't really have to do much in terms of dynamics or engine. So you start noticing the details. Like the soft seat which is nice initially but shortly thereafter makes you want to twitch and shift around to find comfort. And it takes these bikes about two hours in the saddle or more to empty the little fuel we put in so this wasn't a short ride by any stretch of the imagination. It's tiny and so it weaves through traffic with ease and you can just leave it in fourth through most of it. What I did notice was the Splendor felt older than the Dream Yuga in the ride quality and response departments. The Hero does everything but reacts slower. So ride quality is little bit less good than you initially think it is and cornering, even if it is a left turn at an intersection isn't effortless. Certainly not as effortless as the Dream Yuga. City handling is hardly a game of chicken strip comparisons but you can immediately tell that the Yuga has a more modern chassis and that it's better tyres mean more confidence, yes, even in the short left turns. Ride quality similarly is better. It might just be the case that the suspension reacts quicker to bumps and makes the bike feel better  and maybe stiffer than the Splendor as well  but two hours later, the Dream Yuga looks shinier and more appealing. To your eyes and to your bum as well. The quick reactions and the more powerful engine with good gearing also makes it possible to slip through traffic noticeably quicker even if you are actually holding steady economy-oriented speeds. And the fact that the smoother, more refined engine naturally pushes you into going 10kmph faster than you think, appears to have no impact on the economy. The Splendor sputtered to a halt after 71km  52kmpl. The Dream Yuga's go-quicker feel finally showed up when the bike stopped at 64km  47kmpl. To be fully forthright, the Dream Yuga did face more traffic and as you would have seen in Shumi's comparison test, the Dream Yuga is the most fuel efficient motorcycle here. Real world tests aren't really authoritative tests for this reason alone  history repeats itself but reality mostly doesn't like to. Yuga has that happy disposition and the Splendor doesn't. The lack of zest on the Hero though, makes you go slower, stick closer to its economy zones so you might end up with better economy in the real world. But here's the thing. We're enthusiasts. 64kmpl plus two hours of smiles will always outweigh 71km of pure, stolid efficiency. The Splendor wins in the real world. But not our hearts.